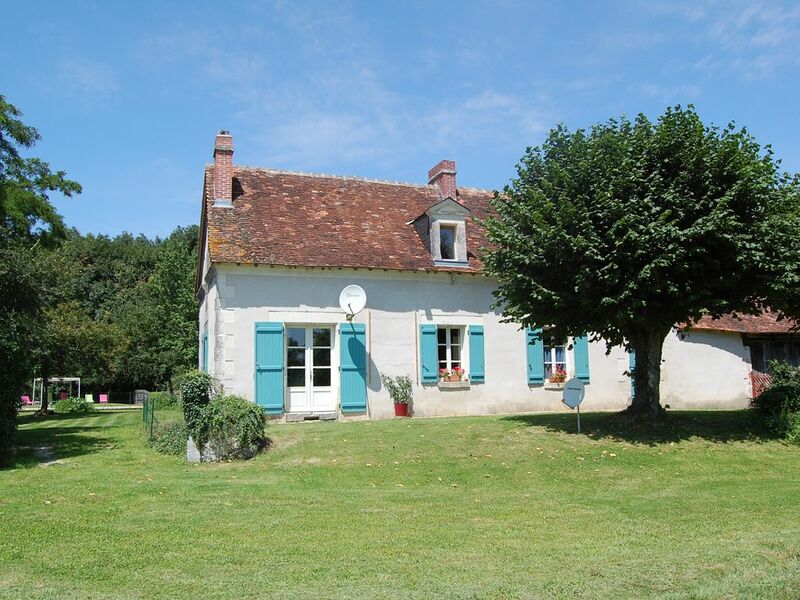 Beautiful Loire Villa, south Loire Valley, private heated pool. Dogs accepted. Loire Holiday Rental. Sleeps 8. Great for family and friends. NO SHARING. This Maison de Maitre is perfect for parties of 6-8. Maison de Maitre....The Master's House. Built in the 1850's, renovated in 2006. The house retains many of its original features,whilst offering all modern facilities. The property is set in 3.79 hectares and has it's own private garden and heated pool. Lounge with French doors leading onto morning terrace. Dining room with French doors leading onto garden terrace. One double room downstairs with adjacent shower room and WC. Two large double rooms upstairs both with original beams and en suite. Two smaller bedrooms each with a single bed, ideal for children. Bathroom across the hallway. Owners lives on site in a separate property. The double rooms each have their own shower, wash hand basin and WC. There is a separate bathroom with bath ,whb and WC. There is a reasonable mobile signal at the property. Available by electric heaters early and late bookings.There is an additional charge of 30€/week for additional heating. All bedding is provided. Please bring own bed linen for cot. In the house, please do not overload. Line available in the garden! The dining room seats 8. There is a large table on the terrace with an umbrella for outside dining. Please request high chair. Plenty of room to play. Separate seating area to enjoy that evening apero! Large table with umbrella. Gives on to larger garden and pool. and Vaping outside only and not in the pool area. Really good place to stay especially with kids. We have recently returned from a fabulous week away here. The pool really made this place as the children were occupied all week. The Set up of the garden was great in that there was various places to sit and relax in the sun or the shade. The owners were nice and friendly and let the children meet the horses. The house is situated in a lovely peaceful rural location. We very much enjoyed the swimming pool and other outdoor equipment. The house had all we needed to make our stay comfortable and was clean and cool. There are plenty of interesting places to visit without travelling too far. A large supermarket and bakery are within a 10 min drive. The owners were very helpful and friendly making us feel very welcome. We had a great holiday. The villa was just as described on the website and Jane and Doug's hospitality was fantastic. We particularly appreciated the private heated pool which made swimming an absolute pleasure, even if there was a nip in the air. We recommend Jane's wine tasting trip. We had a fab day and a wonderful meal. I was good not to have to organise the day and be driven! The property is a good size, well-maintained and full of charm. With 2 teen boys and a 12 year old girl it was very useful to have so many bathrooms, English t.v. and a dining room table for board games! The garden was a great space with the pool a huge success. We enjoyed swing-ball, table tennis and badminton but could also have tried boules and croquet! In the local area, we would highly recommend the go-karts. They do mini-karts for younger children up to about 12 and full size karts for older children and adults. The track was excellent! The nearby town of Loches is pretty and well worth a visit. Further afield, the chateau of Cheverny is great for those who remember watching Tintin and Amboise has lots to offer. Jane and Doug were helpful and friendly hosts with useful advice on nearby facilities. I would definitely recommend this property to friends and relatives. We have just returned from a wonderful fortnight at ‘Maison de Maitre’. We were looking for the perfect ‘Get Away From It All’ and we found it here. The house is pleasantly situated in a large private garden. The lovely swimming pool is situated in its own enclosure complete with sun beds and large shaded cover. It is about 1.2m deep making it perfect for pool volleyball as well as swimming. Outside the house is a terraced area complete with two large garden tables and chairs and shaded cover. We spent many hours out here, chatting, drinking, eating all our meals and playing Bridge into the evening. Inside the house is comfortably furnished and well equipped including with freeview UK Satellite so the boys (12,14 & 53!) could listen to Test Match Special on R5SX and keep an eye on the Open Golf. The house’s old stone walls mean the house remains cool even when the outside temperate is in the mid 30’s. There is a 3G signal at the house however wifi is not available unless you go to the owners property next door. Given our desire to ‘get away from it all’ this level of connectivity suited us fine. The house is situated South of the main wine growing area of the Loire Valley. It takes about an hour to reach the wine centres and chateaux for which the area is renowned. We had a wonderful day visiting the amazing renaissance gardens at Chateaux Villandry and doing some tasting of Vouvray wine. Lovely! The nearest Supermarket, which provided all we needed, is about ten minutes drive away in Chatillon sur Indre There is also a traditional open air market in Loches which is about twenty minutes away. The arrangement of the house and garden was very suitable for our dog as it is enclosed and private and we felt Duffy was made very welcome. There are short and longer walks available from the house along the tracks and green lanes that surround the house. So for us – a fortnight in paradise. We loved it and hope to return. Thank you very much. Thank you both for your lovely review. We are still working on the wifi and hope to have it installed in the gite soon. This is rural France! Hope to see you again soon? Great week with our 2 kids, dog and our friends and their children. Room aplenty and everyone enjoyed the lovely pool fenced-in garden. Very helpful owners and a relaxing place to stay. La Bourjonnerie is situated 20 minutes south of the historic town of Loches, in the Loire Valley. We are found between the villages of Fléré la Rivière and St Flover, and are 7 kms from the rural town of Chatillon-sur-Indre. (D13). The closest boulangerie is in St Flovier at 4 kms so a car is necessary. 15 kms south you can find the Brenne with 100 lakes. A National wild life area, popular with bird watchers. Just 20 mins away is Reserve de la Haute-Touche where you can see animals from five different continents some of them very rare. Zooparc de Beauval - St Aignan - 45 minutes. Chateaux of the Loire, Amboise, Villandray, Chenonceau, Cande all an easy drive. The golf of Loches-Verneuil is economic, ecological, and accessible for all. Of the April 1 to October 31: from9h to 19h every day. Wine Tours by arrangement. Low season packages available. Please ask. Shorter stays March - June and September- October considered. Min 3 nights. Please enquire. . Wine Tours available from the house. Please ask. Well behaved pets accepted. Please ask to confirm. We ask that you exercise them off the property and pick up after them. Plenty of long and short walks. The terrace is fenced. There is a £300 security deposit. Returned within 14 days if no damage is found Bedlinen, towels, heated pool, end of stay cleaning and wifi are included in the price. Please bring your own pool towels. If needing a cot please bring your own cot linen.